In the garden at Bell House is a magnificent old medlar tree, lending its shade to the gate leading to the walled garden. It’s certainly an ancient tree and may even have been planted by the Wrights, who built Bell House in 1767. Its gnarled branches extend out from the shelter of the garden wall and the trunk leans precariously, requiring a sturdy pole to prop it up. By rights our medlar tree should be in the kitchen garden, from where it is planted, as its fruit is edible. Medlars need bletting (maturing and softening) before they can be eaten or cooked but once bletted, it has a flavour that’s been likened to both an apple-pear and a super-charged date and can be eaten raw or preserved. The Elizabethans valued its sweetness as a winter food in the days before the arrival of sugar and medlar jelly was popular with the Victorians and Edwardians as a Christmas conserve. Put some medlars into an earthenware jar, stand it in a saucepan with boiling water nearly to the top and keep it boiling gently over a slow fire. When the medlars are quite soft, pass them through a fine hair sieve, and weigh the pulp, and for every pound allow one and a half breakfast cups of coarsely crushed loaf sugar and half a teaspoonful of allspice. Put all the ingredients together in the preserving pan and stir them over the fire with a wooden spoon until thickly reduced, skimming occasionally. Turn the cheese into moulds and keep them in a cold place. When ready to serve, turn the cheeses out of themoulds on to a dish. (The Encyclopedia of Practical Cookery by Theodore Garrett, 1891). The Bell House medlar tree is very attractive particularly in winter when its intricate twisting stems are highly distinctive. Simple white flowers and glossy green leaves in spring give way to its unusual fruit in autumn. Medlar trees are self-fertile, so you only need one and it is fairly disease and pest resistant, certainly the Bell House medlar is a healthy specimen despite its age. In the autumn we hope to make medlar jelly from the Bell House tree, we’ll keep you posted. If you are interested in Bell House's beautiful Georgian garden you might like to join our lovely garden volunteers. Just turn up on Saturday mornings from 9.30-11.30. Novices, experts and all ages welcome, coffee, croissants and friendly co-workers provided. Most of us love sleeping but we also believe that we don't get enough sleep. Despite this we'll probably sleep for the equivalent of about 25-30 years across our lives. Plenty of experiments show that the sleep quality and quantity affects our memory, our cognition and our behaviour. This is so much so that some researchers even say that how well young people sleep is the main predictor of their academic performance. No surprise, then, that the Bell House speaker, Dr Frances Knight, is a huge fan of good sleep. She is based at the UCL Institute of Education researching the effects of good and bad sleep, and looks at ways to improve our sleep - especially in children. Fran has studied the different types of sleep that are needed such as REM (Rapid Eye Movement) and SWS (Slow Wave Sleep), and how long we sleep in each of these cycles as we age. - Arrange the bedroom so that it is a "sleep haven"
Good sleep appears to have a number of important functions including memory consolidation, helping with recovery from injuries, clearing waste and promoting growth. In contrast, bad sleep leads to impaired attitudes and poor cognitive functioning; it can lead to challenging behaviour and emotional problems. Fran Knight described some experiments where people take tests before and after sleep and they consistently performed better in the morning, after a good night of sleep. One way to help children improve their sleep is an app that UCL are developing called Mobero Intervention which promotes healthy sleep, especially targeted at children and teenagers with ADHD (attention deficit/hyperactivity disorder). This app helps cement a good routine that both parents and children can be involved in, with a rewards-based system for good behaviour. Fran also considered the idea that certain foods may help - such as almond nuts and brazil nuts - and some music may help such as theta wave and delta wave music. As usual with Bell House talks there was, after the talk, a lot of discussion with the speaker and between members of the audience. One woman told me about how her 9 year-old son has built up anxiety about sleep and refuses to go to sleep without her sleeping with him. Fran suggested a technique called "phasing" where you can progressively, over a few days, get your child to sleep - initially staying with them in bed until they are asleep and then staying with them in bed until they are almost asleep, then staying seated in the room until they are asleep and finally leaving them to sleep alone. It was widely agreed that apart from being a possible short term solution, sleeping pills tend to be very disruptive to sleep patterns in the medium and long run. Watch our film HELPING CHILDREN SLEEP Highlights of a talk given by Dr. Frances Knight at Bell House, about ways to help your child sleep. 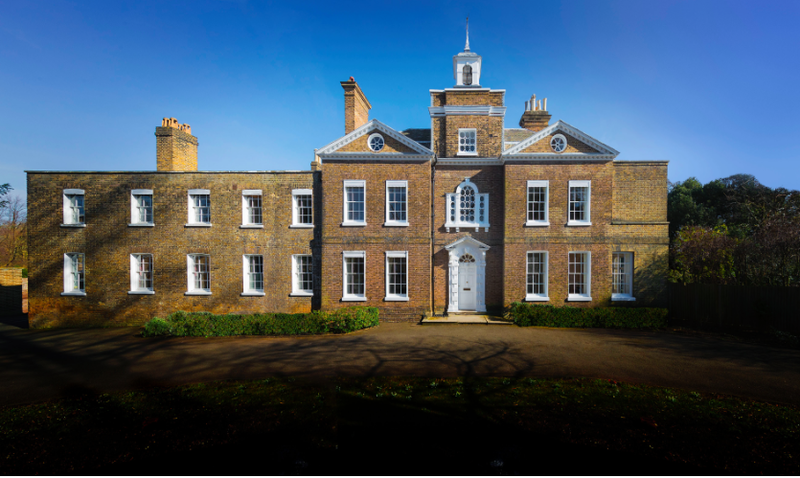 In 2017, the Dulwich Festival provided Bell House Dulwich the perfect opportunity to open its' doors for the first time. By taking part in Artists' Open House, Bell House exhibited work from multiple dyslexic artists. This year, Bell House is welcoming two wonderful artists to hold their debut show. Dry Stone Walls are a metaphor for the marriage between nature and human endeavour. Thousands of years ago, farmers began clearing their land to make way for cultivation; they developed techniques to construct walls, interlocking the foraged stones without the need for mortar. Since then, nature has tried its best to reclaim them, completely transforming the exposed surfaces so that some are unrecognisable as stones at all. My interest lies in the patina created by the action of weathering, the unhurried pace of the lichen, algae and other flora gradually embroidering the surfaces, fashioning walls with real character and personality. Wild Cherry- November 20th. Benjamin Rice. I spent many days touring the urban parks of South London, scouting for the ideal tall thin tree to photograph for my Vertical Landscape series. The moment I saw this lone Wild Cherry, although this tree was the wrong form for that project, I was smitten. She - and I can only think of her as feminine - was everything that I was searching for and more. She has personality - defiance above all. She stands proudly alone, unlike the huddled trees behind her. She may not be perfect, but she is not afraid to flaunt herself. In the spring she flirts and entices with her pink-white blossom. In the early summer she drapes herself in shades of green - vivid and bright at first - but darkening and maturing as the languid days of August and September near. And then, in the autumn, comes her grand finale - the cloaks of blazing reds and golds and burnt oranges, one succeeding the other in rapid succession as if she is seeking to fend off the gathering melancholy of winter. On my first visit to Japan, I arrived with no pre-conceived idea as to what to photograph; being in a largely Shinto country I thought it provident to wait for ‘enlightenment’. Being a keen cyclist, I soon noted that most of the bikes had been parked with great care, neatly and squarely outside the rigid architectural vernacular. This resulted in a flat, almost two-dimensional look to the environment. My Japanese Bicycles series was born. Although at first glance this gallery may appear to be about bikes, it’s really a series of images exploring the nuances of Japanese exterior design. Those curious to see the latest trends in Japanese cycle design may be disappointed, but those seeking to understand the famously enigmatic Japanese character and the intriguing mystery of their absent owners, may be as captivated as I was. My work evolves from weaving with the plant material that I forage and find around me. The city yields unexpected treasures, a good haul includes bramble, willow, beech and birch. My weaving techniques can be traditional or experimental, but it is the textures and qualities of the raw material that determine the final piece. Being a volunteer gardener at Bell House has not only been a very sociable experience but also a rewarding source of materials that would otherwise have ended up on the compost heap. During the exhibition I will be showing a variety of my work including Bell House baskets. This exhibition is held as part of Artist's Open House 2018, in the Dulwich Festival 2018. Bell House will be open throughout both weekends. Please do just turn up on the day. "It's hard to be a celebrity without being dyslexic," claimed Marion in her talk at Bell House. Marion wasn't just talking about techniques that help children with dyslexia to read better, but about the differences in how the brain works for those with dyslexia. It seems everyone has seen, or has plans to go to, the Modigliani exhibition at the Tate Modern. On 15th March, Rosalind Whyte came to Bell House Dulwich to give an art history talk based on this exciting, and ever so popular exhibition. Along with almost 60 other people, I learnt loads about Modigliani’s life, his art, and the works on show at the Tate Modern. A total mixture of people showed up on Saturday 24th February at Bell House, ranging in age from 20 to 65, to learn how to make films on the small camera in their pockets – which also doubles up as a mobile phone. Some brought iPhones and others had android phones, but Cassius Rayner's course works for all these devices; particularly impressive considering there are over 200 different android phones on the market. In just over 5 hours we learnt about light, focus, tracking and editing, and, best of all, we ended up making our own short film. In a rather circular process, the film I made with my two team-mates was a film about a teddy arriving at Bell House to go on a film course. The professional film-makers on the course were planning to make all sorts of short films - for charities, for businesses, and for interviews. Not everyone was a professional, and come came just for the sheer fun of doing something creative. Cassius explained that making a good film is all about a compelling story, told in a way that's eye-catching and easy to follow, so when we were making our films, we focused on creating an interesting story. After shooting, we used a variety of different editing apps to create our finished product. The course was also full of tips and demonstrations of useful kit, from sliders to splitters, and microphones to tripods. None of the smartphone add-ons are absolutely necessary, but it was surprising to see the range that's available. It was great to learn how affordable and cost-effective all the equipment is, and it really did make a difference to the quality of the filming. Benjamin Rice, photographic artist, believes that last Saturday was the first time that the whole of the street facing, front elevation of Bell House has been photographed straight on. This may seem unbelievable, but having been built in 1767, the Georgian house has spent much of its life in the pre-photography era. In more recent years, it was shrouded in vegetation, so a photograph from this angle has not been possible - until now. There are many archive images of the house from the back and from the side, such as the Country Life photo from 1962, dug out by the Bell House historian, Sharon O'Connor, but none showing the structure without horticultural interference. Benjamin, saw that the clearance of the rhododendron has allowed Bell House to wake up, like Sleeping Beauty, and he offered to take a professional picture of the magnificent facade. For this project, he used a three-metre high tripod and a camera with a whizzy (and presumably a fiercely expensive) lens. It was a beautifully clear day, and Benjamin had worked out that the sun would be "kissing the front" at about midday. Some of the ground floor window frames have recently been renovated, the front door freshly painted, the shutters bolted back and finally the distracting 21st century modes of transport were removed, so by the time he was all set, the house was looking its majestic best. Benjamin will be exhibiting at Bell House for the Dulwich Festival as part of the Artists Open House weekends - 12th/13th May and 19th/20th May 2018. He will be displaying a series of very large, but micro-detailed ‘photographic art’ capturing nature’s reclamation of aging dry-stone walls. His wife Pip, a basket weaver, will also be showing her work, some of which have been created from foraged plant material sourced from Bell House’s garden. A fragment of an envelope: how much could it tell you about where it was found or who it belonged to? Andrew McLynn, chief craftsman, is renovating the Bell House windows using traditional techniques to restore them to their original splendour. While taking apart one of the box sashes, Andrew found part of an envelope stuffed inside the window frame, probably by someone repairing the window who needed to fill the gap and picked up some nearby wastepaper. We can see that the envelope was posted by Games Workshop and it would almost certainly have carried their in-house magazine, White Dwarf, which at the time covered fantasy and science fiction role-playing games, in particular ‘Advanced Dungeons & Dragons’ (referred to as AD&D on the magazine cover below). White Dwarf increased its cover price to 85p in April 1984 so our envelope would have been sent out after that as it refers to the cover price being ‘only 85p’. The envelope is addressed to A. Creed. He was a pupil at Dulwich College from 1984 to 1988. Boys at boarding at school would of course have their mail sent to their school address and it’s not surprising that one of them would want to read a magazine such as this one. Was Creed delighted to read his magazine on the day it arrived, or did he squirrel it away to enjoy at the weekend when he had more time? Perhaps he passed it around Bell House after he had read it, so that boys not lucky enough to have a subscription might also enjoy reading about the latest games. 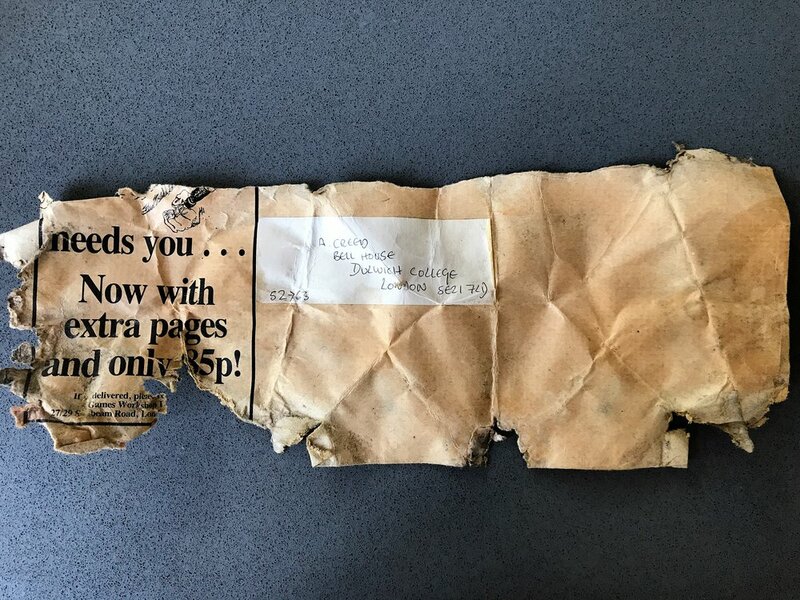 We love finding fragments of history like this, and are very lucky to have our historian, Sharon O'Connor, around to investigate everything we find! Sharon has done SO much research on Bell House, and its residents, that we have two local history talks coming up based on her work. Events at Bell House have been selling out, so make sure you book soon before these tickets go! 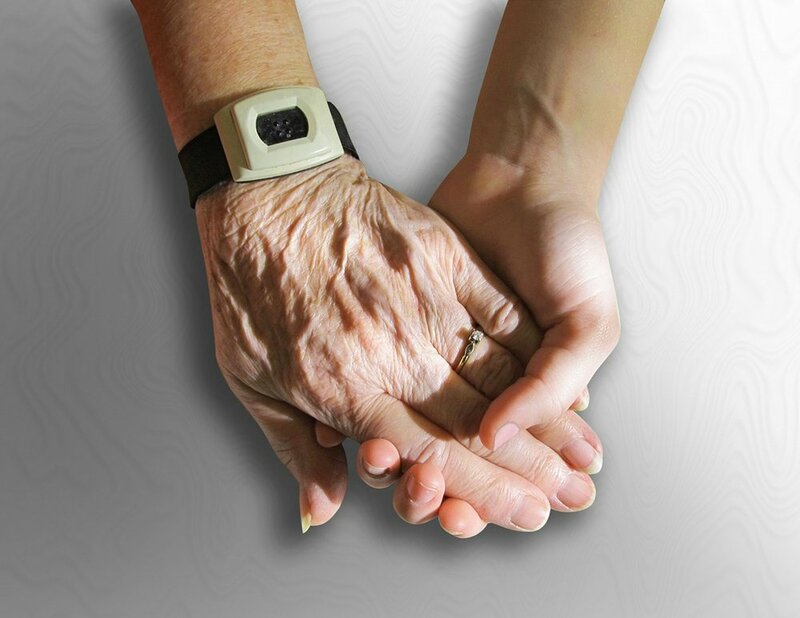 When faced with ageing parents, or other relatives, lots of us step in to help with caring. But this can seem an immensely difficult task. Caring for the elderly presents an absolute quagmire of practical, legal and emotional challenges. “Am I doing it right?” “Am I doing enough?” “Am I doing too much?” These questions often have no clear place to find an answer. Bell House is looking to provide some answers, or at least help people figure out the answers that best fit their situation. Learning to Care is a project being developed at Bell House – it will be a training course, made up of multiple short ‘information sessions’ for local people who wish to help care for the elderly. We hope to cover topics ranging from the practicalities of caring for the elderly, to tricky legal issues such as power of attorney. - People aged over 55 who either have time to commit to volunteering with older people, or are caring for an older relative, or anticipate caring for an older relative. The research will take the form of an interview, approximately 20 mins long, in whatever location is most convenient for the participant. We hope to conduct interviews from March onwards, and they will be completed by experience researchers. Expenses are available for each participant, so you are not out of pocket in helping us. We really do value the thoughts of people in the community who are involved in care for the elderly, and hope this can shape a truly effective programme for local people. If you, or someone you know, falls into either of the categories, we would love to hear from you! Please email [email protected] , or [email protected] to note your interest, or to find out more. Do you learn best by listening? By reading? By looking at colours? By moving around as you learn? For many people, especially dyslexic children, the answer to this question could be the key to unlocking the secret to the most effective revision techniques. As Caroline Bateman explained to a room full of parents at Bell House Dulwich, the answer for everyone is different. We should embrace this, and use our individual learning styles to help the revision process. “Study smarter, not harder”. This really was the theme running throughout Caroline’s talk, as she steered a group of parents with dyslexic children towards a set of techniques that could help with revision. The group was made up of parents who had children of varying ages, which made for great discussion, and opportunities to learn from each other. Instead of reinventing the wheel, Caroline showed us easy ways to transform existing resources into effective and, dare I say it, fun ways to revise. For example, take a PowerPoint presentation used in the classroom. A pupil can turn this into a quiz, so they can test themselves on information they have just learnt. This is a relatively low-tech way to use resources which are already there, and make them more interactive. Caroline underlined the importance of self-testing; it’s the best way for children and teenagers to truly engage their brains, and assess what they have truly absorbed. And a great way to incentivise revision! We also discussed a range of practical tips which are beautifully simple to implement. For example, fitting school folders with a small plastic wallet containing coloured pens, glue, hole-punch, and post-it notes. This saves time when revision rolls around, and kids know exactly where to find all their revision stationery. Seeing such an organised, well-equipped file made lots of us in the room at Bell House wish we had these tips when doing our own school exams! "The whole globe could become citizen film-makers" declared Cassius Rayner, as he spoke at Bell House about the power of using smartphones to create short films. He's been impressed by what's happening in America, and in the film industry generally, where smart phones are enabling surprisingly high quality film-making. A driving force for this is lower costs, and Cassius describes this as “accessible and affordable film-making". For example, a rig to mount a smartphone with a good quality microphone and tripod could cost under £100. The group of us tried out various gadgets, attachments, lenses, and pistol-grip devices. Everyone loved the gimbal which keeps the smartphone steady, even when you are moving around. Our group was a very mixed bunch with film-makers, photographers, charity publicists, a video-based start-up and people who are making the Bell House films. We watched clips that Cassius had made, and he demonstrated the techniques he uses. We also learnt how to fix the focus of the smartphone, how to increase the exposure and how best to get close-up pictures. Audio is critical, and a range of microphones were demonstrated. The main filming app Cassius personally uses is FilmicPro, which he demonstrated to the group. There are several other great filmmaking apps available of which a few were shown. Finally, we considered three editing app options recommended by Cassius. One big advantage of making a film on your iPhone or Android smartphone is that when you go out filming in the street people don't ask what you are doing. Taking photos on smartphones is so common that people barely notice, whereas if you were using traditional equipment you can attract unwanted attention, “Smartphone filmmaking offers so much freedom to explore”. This medium is so exciting, it prompted Steven Soderbergh to come out of retirement and make a totally smartphone-based film, "Unsane" – to be released in March 2018. Even film-makers using traditional methods are now often using smartphones to do a low cost dry-run. The quality of smartphone films and amount of cost saving kits available is making the success of smartphone filming inevitable. The Queen Bee's behaviour may seem the ultimate in promiscuous, as she can mate with large numbers of drones. Many of the drones in a hive don't even get the chance to mate but those that do have their genitalia torn off in the process and then die. Having taken the drone's sperm off him the queen bee stores it in a special pouch and uses it later for when she lays eggs. Life expectancies are different too - the queen lives for about 4 years, whereas drones live for a few months at best, and worker bees in the summer only last for about 6 weeks. I learnt all this in the introduction to bee-keeping at Bell House Dulwich where Philip Nicholson was leading the course. At the course I met a mix of people - an allotment holder hoping to get bees installed on their allotment, a bee-keeper from India who is planning to set up an apiary in Forest Hill, and one young woman wanting to join the bee-keepers at Bell House as "apprentice bee-keeper number 3". Philip used exhibits and slides to explain the life of the bee, the bee-keeping year, diseases of the hive and how to deal with swarming. Occasional swarms, by the way, are quite normal and are an inevitable aspect of bee-keeping as the bees try to set up new colonies. In looking at pests and diseases, Philip told us how to counter the Varroa mite, wax moth, chalk brood, wasps and bigger animals such as mice and woodpeckers. Apart from being a terrific hobby, bee-keeping is a contribution to the environmental through pollination of flowers and trees. For most bee-keepers a major objective is to make honey: we were told how to take off "supers" laden with honey, remove the wax capping, centrifuge out the honey and put it into jars. Proving how productive bee-keeping is, Philip gave attendees a jar of honey which he (and his bees) have made in Kent, but next year I hope he may be able to supply honey made at Bell House in Dulwich. If you’ve passed Bell House recently don’t be alarmed. We are not demolishing the beautiful Georgian wall that divides the house from College Road. Part of the wall, damaged in the past, needs repairing and we are taking the opportunity to widen the entrance to allow access for emergency vehicles. Matt is undertaking the repairs and Bell House photographer Sue Robinson has taken a closer look. Matt has carefully dismantled the wall, brick by brick, and given each brick a unique code. This careful system will allow him to reinstate the bricks in their original positions, including the blind arch. Matt has tried to save as many of the original bricks as possible but unfortunately, due to past repairs with cement mortar, many are unusable. Matt explained that mortar is the sacrificial element in masonry, it should always be weaker than the material it is binding. Cement mortar can trap moisture within the brick, causing crumbling or ‘spalling’. 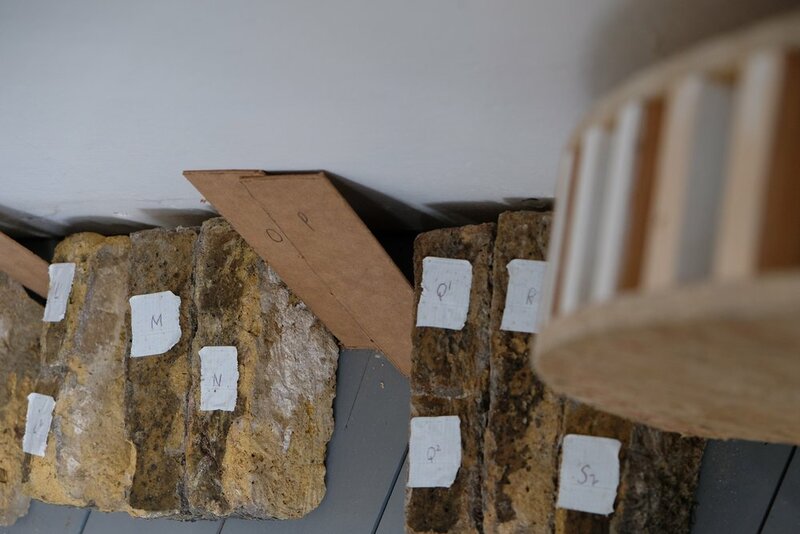 When Matt begins rebuilding next week (weather permitting), he will be pointing the Georgian bricks with a traditional lime mortar as it allows the brickwork a certain amount of flexibility, helping to protect them from damage. He has sourced some recycled bricks to replace those too damaged to use and will reinstate the wall including the blind arch, so that it has the same integrity as before. Soon the wall will look pretty much as it did originally. Next time you are passing, see if you can see the join. After qualifying as Master Stationer Thomas Wright and his brother-in-law William Gill opened a shop in the chapel of St Thomas à Becket in the centre of the old 12th century London Bridge. It had a lower cellar at (or under) water level which they used as a warehouse and an upper room at bridge level that served as a shop. From here they supplied paper to government departments such as the Board of Longitude which had been set up to solve the problem of finding longitude at sea. Thomas Wright’s success also stemmed from bidding for monopolies for the printing of books. He secured the right to print and sell almanacs, a highly profitable franchise. More financially rewarding still was the printing of bibles and prayer books. In 1765 he bought the monopoly to print religious works for Oxford University after the previous printer, the Baskett family, had produced books riddled with mistakes. One book had been called the ‘vinegar bible’ because the parable of the vineyard was misprinted as the parable of the vinegar. Baskett employed ‘idle and drunken staff’ and things got so bad the university had to buy their religious books from Cambridge. Thomas Wright cleverly agreed to protect the risk-averse university against any loss brought by the notoriously litigious Baskett and this helped him win the lease. Since Oxford held the right to print the King James Authorised Version, this proved highly lucrative to Thomas’s firm until the American War of Independence affected their overseas market and an increase in paper costs caused them to withdraw from the lease. Many of their books survive in libraries around the world such as the British Library and the Royal Collection. Wright & Gill were the last leaseholders as the University took the work inhouse and started what became the Oxford University Press. One of the tenets of Bell House is to offer children the opportunity to unleash their creativity and on 25 May 2017 a group of boys from a creative writing club at Dulwich College visited the house to be inspired by some of its many stories. As they turned into the Bell House drive and before they had even entered the house they were greeted with ‘Welcome to the eighteenth century!’, as house historian Sharon O’Connor told them about poor James Simpson, sentenced in 1769 to transportation to America for the theft of a coat worth 20 shillings, stolen from the front seat of the Bell House carriage. The coach had been standing exactly where they were now hearing the story and they were able to look down and see some of the very cobblestones over which the coach was driven. The group moved through Bell House’s elegant rooms, learning about past residents such as Thomas Wright, the paper merchant who built the house in 1767 as a rural retreat from city life. They were excited to handle an original 1794 almanac, of the type printed by Thomas. They learnt that Anthony Harding, the house’s second resident, opened the world’s first department store in Pall Mall in 1796, and they studied engravings of his shop. The boys were fascinated to hear about John Wissmann, who like them had been at school at Dulwich College and who later became Dulwich’s first casualty of World War One. The boys asked many fascinating questions about Bell House, ranging from whether servants would have slept in the cellar to what might be the total cost spent on the house since it was built and they all made careful notes in their creative writing notebooks. On the top floor they rang the house’s eponymous bell, installed to assemble people for local firefighting. Out in the beautiful garden they saw original hand-coloured drawings of the garden beds and paths and heard about an out-of-control firework party held in the 1950s when Bell House was a school boarding house. They also saw the Georgian ‘ha-ha’, the sunken wall designed to keep sheep out of the garden while at the same time being invisible from the house. The stories inspired by the time spent at Bell House will be available on our website. Is this the face of Thomas Wright? Front doors are often an eye-catching feature of a Georgian house and Bell House is no exception. The handsome doorcase, six-panelled door and intricate fanlight are decorative enough to hold their own, even against the octagonal panes of the beautiful Venetian window above. Listed Grade II* and one of the top 8% of listed buildings nationally, Bell House is of particular historic importance and any restoration work must be expertly done. Rick is restoring the front door at the moment and as he painstakingly removes the accumulated paint and dirt of 250 years the exquisite detail of this Georgian gem is coming into focus. Speaking architecturally, Heritage England refer to ‘the open modillioned pediment supported on carved consoles, alternate block sides and archivolt with masked keystone’. For me, that ‘masked keystone’ is the most intriguing feature. The face, placed centrally above the front door, has long been thought to be Thomas Wright himself, the man who built Bell House in 1767. We know what Thomas Wright looked like as there are two surviving portraits of him: Thomas Wright miniature (LMA) and portrait (Stationers' Company) So, is the face presiding over the front door of Bell House its first resident? Comparing it with these portraits I think we can agree it’s probably not. So, who was it? Was it a memorial to Thomas Wright’s father, who died when Thomas was just four years old? Was it the builder? Or is it just a generic face chosen from a ‘pattern-book’, those widely-used style guides that gave detailed instructions on how to get the Georgian look. Whoever it was, his newly-restored features are nearly ready to preside over the house for the next 250 years. As an aside, this is not the only masked keystone in Dulwich as North Dulwich station, built a century after Bell House, has one over each of its three entrance arches. Almanacs began to be published annually in London from the 1600s but became wildly popular in the following century, were still produced into Victorian times and survive today in the form of Old Moore’s or Whitaker’s Almanack. However, the very first almanacs were produced in the second millennium BC in the Near East, providing information such as favourable and unfavourable days and how to deal with each of them. London Almanack 1794 recently acquired for Bell House collection. 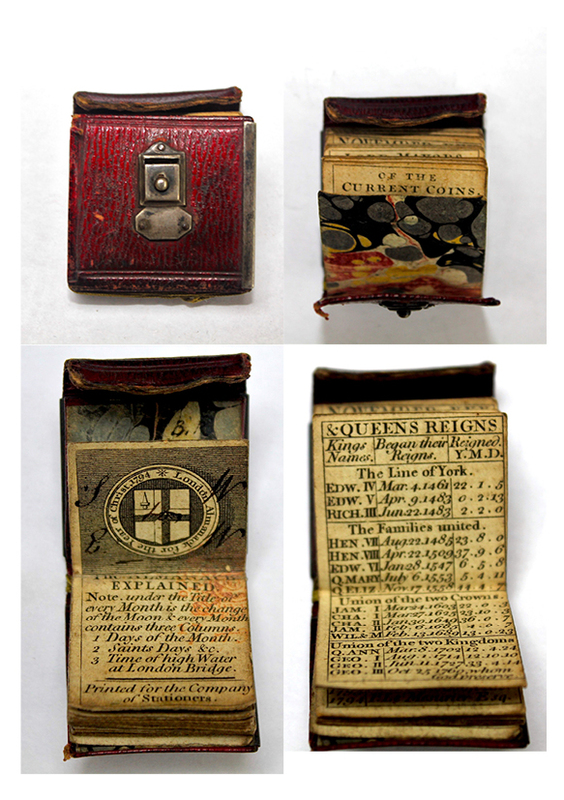 Early English almanacs were sold either as a broadsheet, the precursor of the modern calendar, or as a pocket almanac like this one. They contained astronomical data such as the number of days of the full moon (useful for travelling in the days before street lighting) and used that data to produce weather forecasts which were vital for both agriculture and commerce (aiding decisions such as the movement of ships). They then began to be aimed at different groups such as farmers who got planting data, or Londoners who received municipal information such as lists of City officials and public holidays, and so they became very important to the economy. Our example is tiny, at 3cm square it is smaller even than a matchbox. It has a burgundy leather cover with a metal clasp, although the leather flap fastener is missing. There is a metal plate under the fastener with enough space for someone’s initials, though ours is not engraved. Inside there are twenty gilt-edged leaves plus text pasted to the reverse of the front and rear marble endpapers. There is a tiny pocket inside the upper cover. Engraved throughout, the title page contains the arms of the livery company of Stationers with a second coat of arms on the reverse of the second leaf with a handwritten note: ‘T.W for E.W’. The tiny almanac measuring just 3cm square. The data inside includes a month by month summary of 1794 with festivals and sun/moon rising/setting times. Following this is a fascinating table of kings and queens which describes the Tudor line as ‘The families united’ and the Stuart line as ‘The union of the two crowns’. Details of past Lord Mayors and sheriffs follow and here Thomas Wright is represented in both lists. Finally we have a list of annual holidays and a table of current coins by weight. It is possible Thomas Wright printed this almanac as Wright and Gill derived a large part of their income from printing almanacs and he was an eminent member of the Stationers’ Company, for whom this almanac was printed, having been their first lord mayor for over thirty years when he was inaugurated in 1785.